Fluval filters are engineered to be quieter and run almost silently in the background. It also features a multistage filtration process that makes sure that it maximizes debris removal from the water. Possible filter combinations include the mechanical, chemical, and biological. The possible filtration combinations remove a huge amount of debris and contaminants keeping your water polished. A canister aquarium filter – such as Fluval 406 – is a go-to if you have a large aquarium. Because canister filters are installed outside of the aquarium, they can be as big as necessary to ensure proper filtration. Besides, Fluval 406 can be easily put away from the view beneath the aquarium. Lastly, making adjustments with a filter that is outside of the aquarium will be much easier. Fluval 406 aquarium filter supports aquariums with up to 100-gallon water capacity. That’s almost 400 liters! This further shows that this canister is a great choice if you have a big fish aquarium. The flow rate of Fluval 406 is 1450 liters per hour/383 US gallons per hour, which means that it would take about 15 minutes to filter the whole water in a 100-gallon aquarium. And by the way, the motor hydraulic system has been improved since the times of the 05 Series as well to reduce maintenance frequency. Fluval equipped this aquarium filter with a multi-stage filter system consisting of several filter baskets. Ideally, you should fit the baskets with as many kinds of filter media as possible, but the good thing about this system is that you are free to do anything you wish. Remarkably, the filtration system of the 406 allows it to work with both fresh and saltwater aquariums. 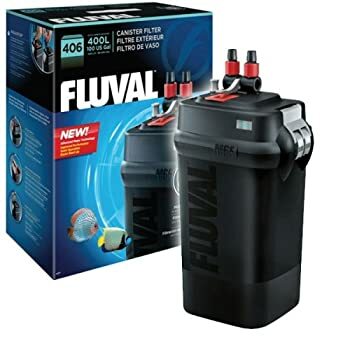 By default, Fluval 406 comes with twin vertical foam pre-filters, a mechanical stage with foam, a biological stage, as well as a chemical stage equipped with activated carbon. The mechanical stage catches the debris that comes from the aquarium’s animals and plants, the biological stage facilitates oxygen production in the water to ensure the well-being of the beneficial bacteria colonies living in the aquarium, whereas the chemical stage catches harmful chemicals and pollutants. Pretty much, you are getting a ready-to-run aquarium filter out of the box. In the future, you could either get the same filter media or replace them with something else. It should also be noted that the filter system is equipped with a clog-proof intake strainer designed to ensure that Fluval 406 performs the way it is designed to. The patented and, most importantly, secure AquaStop Valve system allows you to adjust the flow of the water going through the filter via an easy-to-use handle. And all that without disconnecting the hosing, by the way! You could cut off the water flow completely, set it to its fastest, and also select everything in between. The intake and output hoses are installed onto the aquarium via lift-lock clamps. They allow for flexibility during the setup of the intake and output hoses: you could set them as far apart as necessary to make sure that the just filtered water doesn’t get into the filter again. The clamps also keep the hosing tightly in place so it doesn’t wiggle around under the water pressure. Though keep in mind that some users complained about the insufficient suction power of the clamps to hold the hosing tight in place, so you may need to order a couple of additional clamps to ensure its solid positioning. Canister aquarium filters require siphoning. That isn’t the easiest-in-the-world thing to do, but thankfully, Fluval 406 comes with a self-priming system activated with a push of a button. Fluval 406 is equipped with a precisely engineered bearing. That combined with the sound dampening impeller design makes this aquarium filter 8 – 15% quieter. Aquarium filters can be rather noisy, so this feature certainly is a strong advantage in our book. When compared to the Fluval 05 Series filters, the 06 series – including the 406 – has a number of advantages. Firstly, the impeller cover is redesigned to be less prone to breakage. The priming system is also re-engineered for easier startup. Lastly, the clamp locks of the 06 series are stronger, though not spot-on, as we already discussed. Apart from that, there might be some issues with the more or less flimsy plastic parts in the 406, especially in the valve system. Fluval 406 is backed up by a 3-year limited warranty, which covers manufacturer defects under normal aquarium use and maintenance.